One of the controversial Windows 10 policies is the mandatory automatic update. This means that your Windows 10 will receive and install new updates automatically when you are connected to the internet. While this is a good thing to ensure that your computer has the latest Windows 10 improvements and security patches, it is challenge for many users, especially those on limited data plans. Related: Fix slow Windows 10 PC. Windows 10 will force you to upgrade with multiple notifications during working and shutting down your PC. Though you can choose to install the updates later, you can’t stop the notifications bugging you. Also the automatic update runs in the background may disturb the frontend work you are doing without your knowledge (unless you have setup active hours option in “Updates & Security” settings). Unfortunately most of the recent upgrades bring many problems to users instead of enhancements. In fact, Microsoft temporarily paused the rollout of Windows 10 version 1809 after hearing feedback that the upgrade deletes files on the system. In our opinion, similar to macOS, the upgrade of operating system should be optional. Even if it a security release it should be with the concurrence of the user. So it makes sense for people to think of disabling the automatic updates. Below we discuss how you can block automatic Windows updates. If you access the internet by connecting to Wi-Fi, you can stop Windows for automatically updating your PC by changing the Wi-Fi settings. Unfortunately, this option will not work if your uses Ethernet cable to connect to the internet. Step 1: Open Windows “Network & Internet” panel. You can do so in three ways. Click the network icon on taskbar at the right bottom corner of the screen. The icon can also be hidden in the Windows tray. Click on the Wi-Fi icon and the select “Network & Internet settings” (on some versions it may show as “Network settings”). You can also use the keyboard shortcut. Press the “Windows + I” keys on your keyboard to access the Windows Settings app. Select the “Network & Internet” option. Or search for the “Change Wi-Fi Settings” on the Windows search box and hit the enter key on your keyboard. Step 2: Click on “Wi-Fi” on the left-side pane, and select your wireless connection. Step 3: You will see multiple options on the next screen. Scroll down and turn on “Set as metered connection” slider. 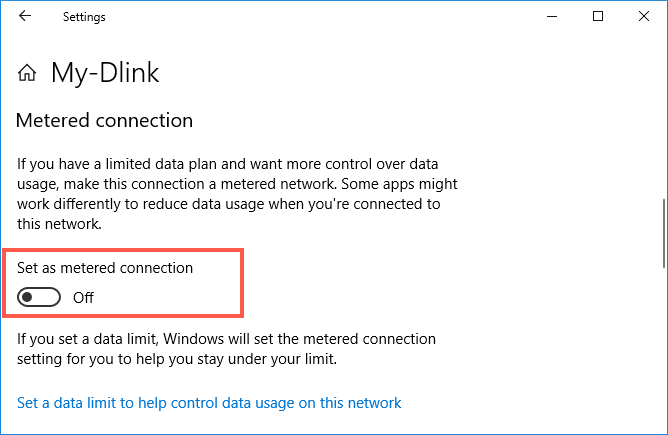 Windows 10 will limit your network activities to control the bandwidth. This will help to stop automatically looking for the update which needs internet connection. Step 1: Open the Run command by pressing the “Win + R” shortcut keys on the keyboard. Type “services.msc” and hit enter. Step 2: This will open a list of local services. Scroll down to find the “Windows Update” process. Step 3: Double click to open “Windows Update”. 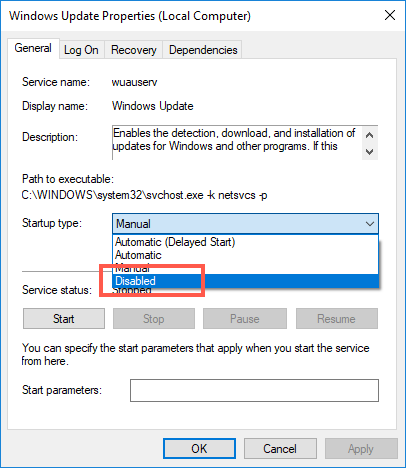 Under “General” tab, change “Startup type” to “Disabled” and then click ok.
You can disable automatic Windows update by editing Windows registry entries. 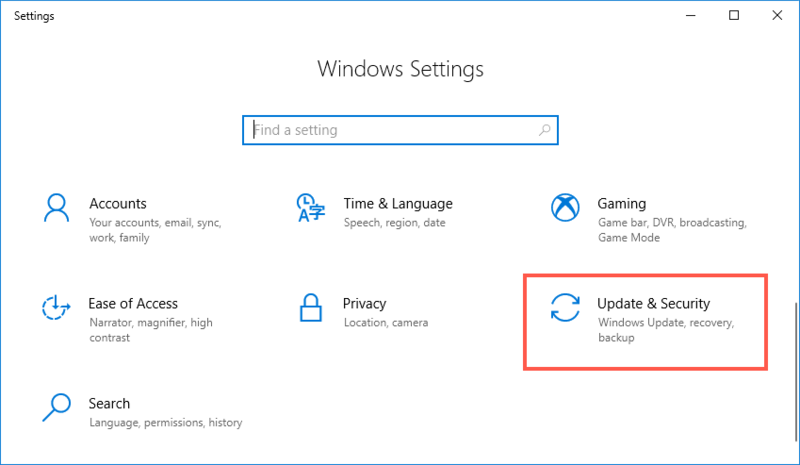 We recommend you to backup your registry before you try this option. Step 1: Launch the Run Command by pressing “Win +R” keys. 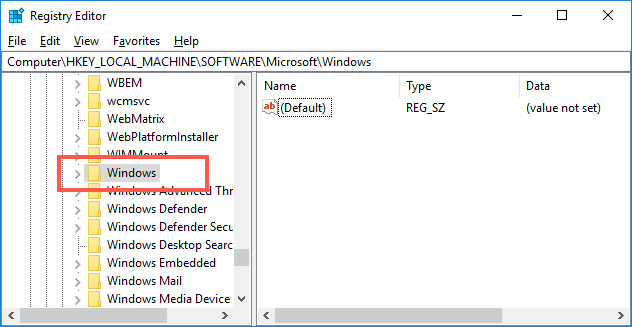 Type “regedit” and press enter to open the registry editor. Navigate through the Path “HKEY_LOCAL_MACHINE\SOFTWARE\Policies\Microsoft\Windows”. 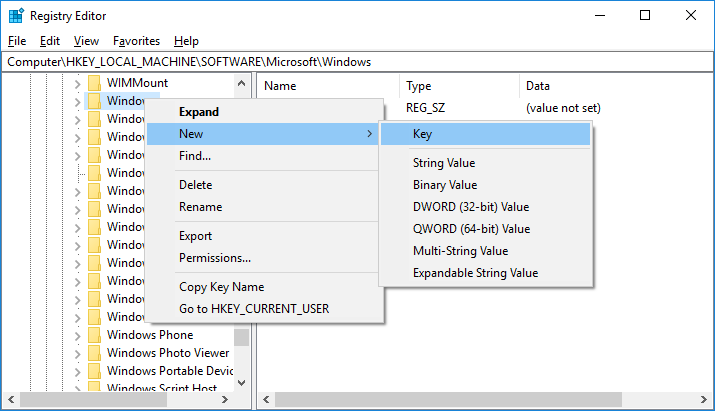 Step 2: Right click on “Windows” folder, Select “New” and choose “Key”. Step 3: Rename the new key to “AU” and press enter. 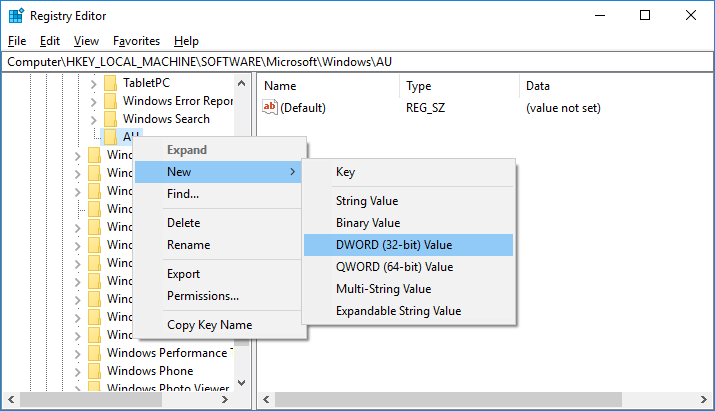 Right click on newly created “AU” key, choose “New” and click “DWORD (32-bit) Value”. Then rename the new key to “AUOptions”. Step 4: Double click on the “AUOptions” and change the value to 2, then click “OK”. Windows 10 Pro, Education and Enterprise editions have an additional feature called Group Policy Editor. 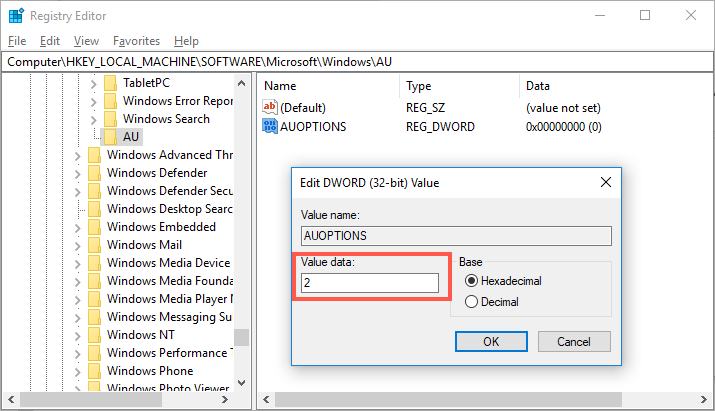 You can configure the automatic update in Group Policy Editor. 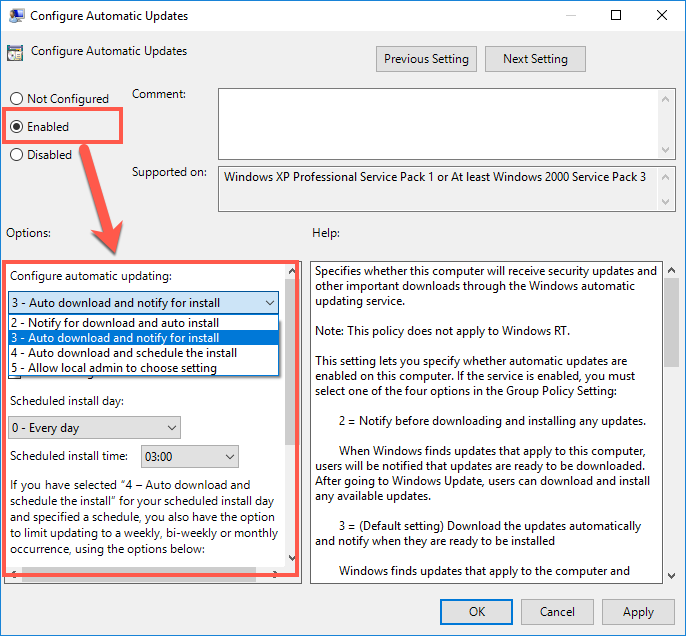 This tool offers multiple ways to configure auto updates like completely disabling or enable with download and install notifications. Remember, Group Policy Editor is not available for Windows Home version. Step 1: Press “Win + R” keys and open Run Command prompt. 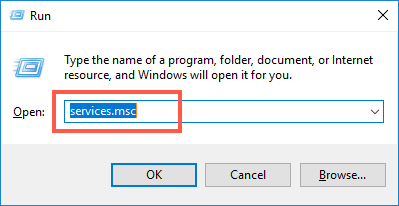 Type “gpedit.msc” and hit enter to open Local Group Policy Editor. Alternatively you can search gpedit in Windows or Cortana search box to open the policy editor app. 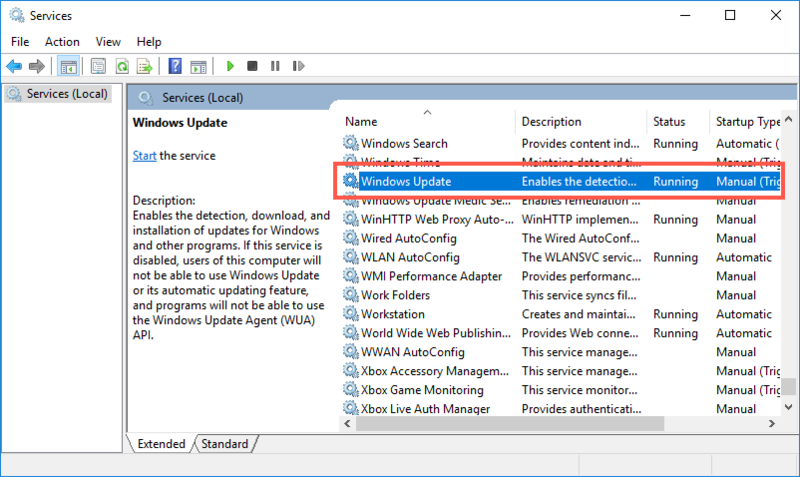 Step 2: On policy editor, navigate to “Computer Configuration > Administrative Templates > Windows Components > Windows Update”. 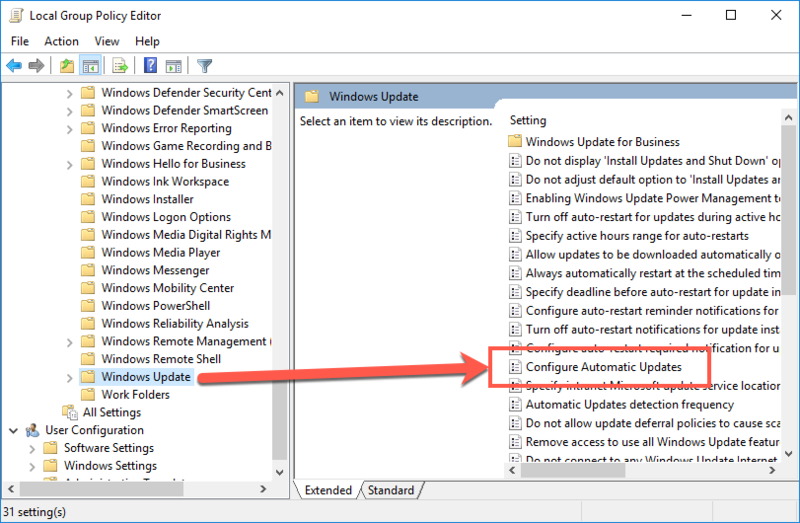 Step 3: Highlight “Configure Automatic Updates” setting on the right pane and double click or enter. Step 4: Choose “Disabled” radio button and save your changes by clicking on “Apply” button. Step 5: In case, if you want to configure auto update option then click on the “Enabled” option. Now you will see all the frozen fields are opened for editing. Choose one of the four available options from the “Configure automatic updating” section. When you select the option 4 – auto download and schedule the install, you can further configure the scheduling day and installing time. You can also schedule weekly, monthly or bi-weekly update and choose the week of the month. Windows updates are important for your PC security and optimal feature functionality. However, if you are running on limited data connectivity, they can slow down your connections. 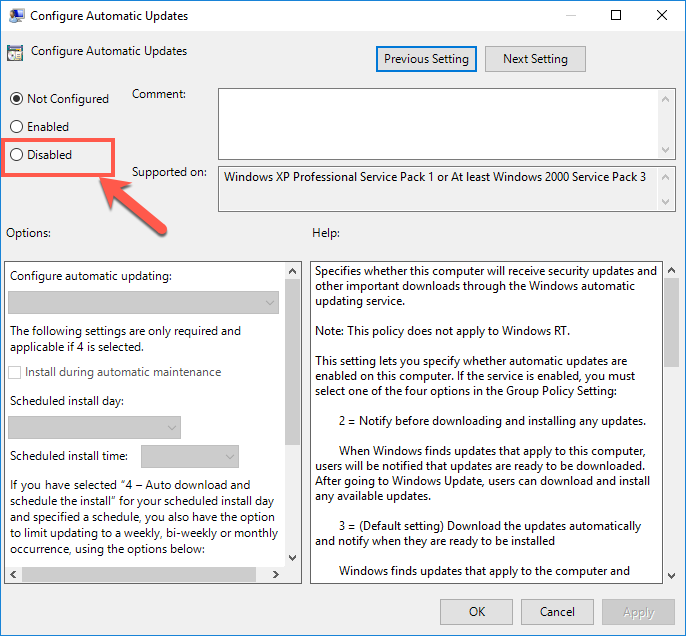 For whatever reason you wish to stop automatic Windows update, you can use one of the above options depending on your Windows version and type of connection.